This artwork is devoted significant date in the musical aesthetics of the 20th century, to the centenary of the manifesto Luigi Russolo "The Art of Noises". Written in 1913 by an appeal to musicians contemporaries, encourages use them to further the development of music, innovative tools produce major noises that appeared in our life with the advent of machines and mechanisms. The original sound that I use in this work, does not sound in the final soundtrack. Working in the direction of the Russolo, extending the frequency range of scores up to the limits of modern audio playback devices, I picked it up tone beyond human hearing. The soundtrack I suggest you listen to, made of artifacts - mathematical errors encountered by computer based microwave modulation of sound, the nature of which today I find it difficult to explain. 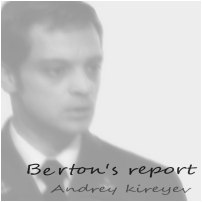 This situation seemed similar to the one which hit the protagonist of Andrey Tarkovsky's, the pilot Berton, who tried in vain to explain what he saw in his report on the Solaris phenomenon, not recorded his movie cameras. I turned on the movie "Solaris" and had difficulty coping with an unusual sound, played for you a modern version of the soundtrack for the film of this episode. Since the work of Luigi Russolo and Andrei Tarkovsky harmoniously united in this effort, I can assume that these two great men - the descendants of the extraterrestrial people, worthy of respect.